SAN FRANCISCO, California, February 20, 2015 (ENS) – California’s largest utility, Pacific Gas and Electric Company, PG&E, is asking state regulators for permission to build some 25,000 electric vehicle chargers at sites across its service area in Northern and Central California. If approved, this program would be the largest deployment of charging stations in the country. The chargers would be located at commercial and public locations, including multi-family dwellings, retail centers, and workplaces. Roughly 10 percent of the chargers would be installed to support disadvantaged communities. PG&E proposes to offer tools and educational materials for site hosts and customers to learn about the benefits of electric vehicles. More than 60,000 plug-in electric vehicles are currently registered in PG&E’s service area, which represents more than a fifth of all EVs in the United States. California Governor Jerry Brown has called for 1.5 million zero-emission vehicles in California by 2025 to help meet the state’s ambitious goal of reducing greenhouse gas emissions 80 percent below 1990 levels by 2050. To support that plan, industry models suggest that PG&E’s service area will need about 100,000 Level 2 chargers in public locations by 2020. All of the 25,000 stations PG&E proposes to build would have Level 2 chargers, which provide up to 25 miles of range for every hour of charging. To support travel between metropolitan areas, PG&E would also install at key locations 100 DC fast chargers, which can recharge an EV’s battery in only 30 minutes. A growing number of DC fast charging stations are being deployed along the “West Coast Electric Highway,” which serves drivers from the province of British Columbia, Canada, along the three U.S. states of Washington, Oregon and California and south into Mexico’s state of Baja California. The utility expects that the program will take about five years to complete following approval by the California Public Utilities Commission, which received the proposal on February 9. The cost of PG&E’s plan, if approved, would be shared by all electric customers as a contribution to helping the state meet its clean air and climate goals. That cost is pegged at US$653.8 million. The chargers would be provided at no cost to the site hosts. PG&E proposes to own all of the infrastructure, but contract with third parties to build, install and maintain the chargers and manage customer billing. A typical residential customer can expect to pay about 70 cents more per month over the period 2018 to 2022. 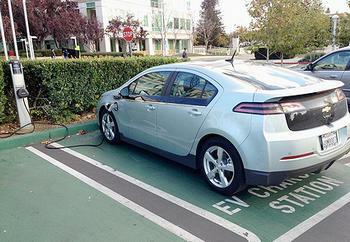 PG&E is a strong supporter of transportation electrification for a cleaner environment. The utility has more than 1,200 electric-base vehicles in its fleet, and is a leader in introducing new electric technology into its vehicles. CEO Earley is co-chair of the Edison Electric Institute’s Electric Transportation Task Force. PG&E was one of the first U.S. utilities to offer money-saving rate plans for EV customer charging and recently announced a smart-charging pilot program with automaker BMW.